Freshman Collin Alvesteffer carries the ball. Photo by Kelly Alvesteffer. 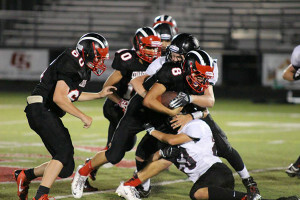 After a tough loss against Zeeland West last week, the Cedar Springs JV football team came back ready to play against the Hawks of Forest Hills Eastern. On Thursday, September 25, the Red Hawks defeated Forest Hills Eastern 34-7 at Red Hawks stadium. This win now makes the team 4-1 overall, and 1-0 in conference play. “After last week’s loss, we went back to the fundamentals in practice,” explained Coach Streeter. Freshman quarterback Collin Alvesteffer scored two touchdowns and rushed for 58 yards. Anthony Topolski was the team leader in rushing yards, with a total of 137 for the game. Topolski also scored 2 touchdowns and made a 2-point conversion. Keenan Gosselin was the second team leader in rushing yards coming in with 109 for the game. The defense for the Red Hawks was also on point, with Keenan Gosselin intercepting the ball for a 17-yard touchdown and leading the team in tackles. Bryan Cebrero also intercepted the ball and ran for a 90-yard touchdown! Damarcus Barnett led the team in TFL’s and finished off the game with 6 total tackles. “We had some guys that were challenged earlier in the week to play better and they answered the challenge,” says Streeter. On Thursday, October 3, the JV team takes on the Northview Wildcats for their second game of conference play at Red Hawk stadium. Kickoff is at 6:30 p.m., so come out and support your JV team!